This is a classic Italian recipe. My family is from the Italian Alps and use Dairy products profusely in cooking. This is a go to for me when I have left over pasta. 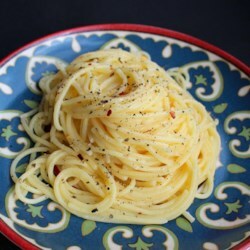 Use SALTED BUTTER and FRY pasta in butter until crispy (takes about 10-15 mins) and then add black pepper. It’s a great stand alone or side dish. BTW, I freeze our extra pasta over time and when I have enough saved I fry it up. This doesn’t require all of the pasta to be the same (linguine, penne, spaghetti, etc) all marry well and are used in one simple and delicious dish.